The most famous coins of the U.S. In 1849, as gold began to flow from the mines in California, Congress approved the creation of a new $20-denomination gold coin. Known as a Gold Double Eagle, as it was twice the value of the $10 gold"Eagle, the coin would become a symbol of wealth, instantly bringing respect and admiration to the holder. Internationally, the coin served as a powerful reminder of the emergence of the United States as a world power. Designed by the Mint's Chief Engraver, James B. Longacre, two Gold Double Eagles were struck as pattern coins in 1849. One of the coins was safely stored away and the other was presented as a gift - only to disappear and never be seen again. The surviving coin was moved to the Smithsonian Institution where it will remain - protected and preserved - as part of the nationalarchives. Since it can never been sold, the only existing 1849 Liberty Head Gold Double Eagle is considered priceless, but some experts have estimated its value at between $10 and $20 million! Bornin Pennsylvania in 1794, James B. Longacre developed his artistic talents at a young age and worked as an apprentice at an engraving firm. Longacre made a name for himself by illustrating biographiesof important figures and was later appointed Chief Engraver of the U.S. Mint, a position he held 1844 until his death in 1869. 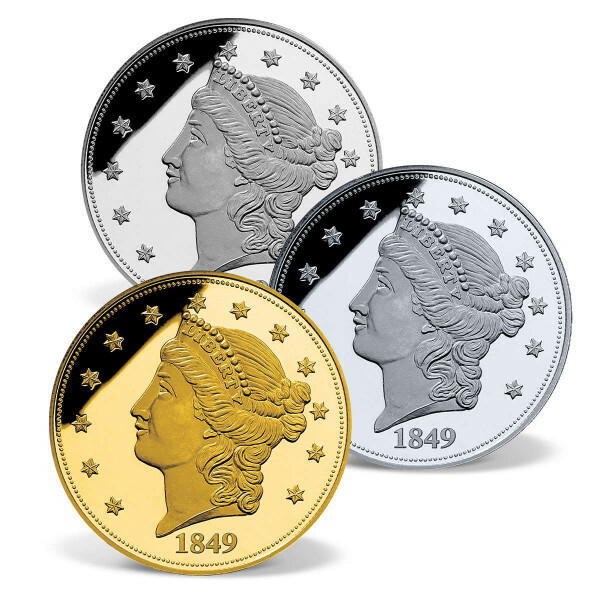 A prolific designer, Longacre had a hand in re-designing many U.S. coinsthroughout the mid-19th Century, including the 1849 Double Eagle and the 1854 Three Dollar gold piece.